^ a b Toledo, Rodrigo (3 September 2011). Adams, Keith (ed.). "BMC in Chile: A potted history". Around the World: Chile. AROnline. Retrieved 25 August 2014. ^ "Pauli Toivonen and Harri Toivonen Profiles". Thruxton.f9.co.uk. Retrieved 3 March 2017. ^ "The Latest Racing News | Castle Combe Race Circuit". Castlecombecircuit.co.uk. Retrieved 3 March 2017. ^ "Team Bailey racing back on track and on tour for 2014 – News". Touring and Tenting. Retrieved 3 March 2017. ^ "Austin Mini Cooper S at the Chateau Impney Hill Climb, Droitwich". Chateauimpneyhillclimb.com. 16 February 2016. Retrieved 3 March 2017. ^ "Millionth Mini – British Pathé". Britishpathe.com. Retrieved 3 March 2017. ^ 23 January 2014 (23 January 2014). "Two Millionth Mini – Special – British Pathé". Britishpathe.com. Retrieved 3 March 2017. ^ Day, James. 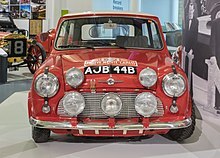 "classic Mini | library of motoring – An online collection of MINI information". Libraryofmotoring.info. Retrieved 3 March 2017. 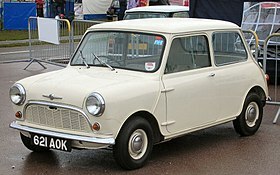 ^ "Classic Mini Cooper". Bloomberg. Retrieved 3 March 2017. ^ "Federal Motor Vehicle Safety Standards and Regulations". Nhtsa.gov. Retrieved 3 March 2017. ^ "FAQ". Miniusa.com. Retrieved 3 March 2017. This page was last edited on 22 April 2019, at 17:57 (UTC).